New Party Place - TREND - CHOMP! SLURRP! BURP! We started with some of their mocktails – kulfi faluda, hibiscus iced tea and tiramisu shake. The hibiscus iced tea was very refreshing but the other too were rather half hearted. The food however was a different and tantalizing story altogether! 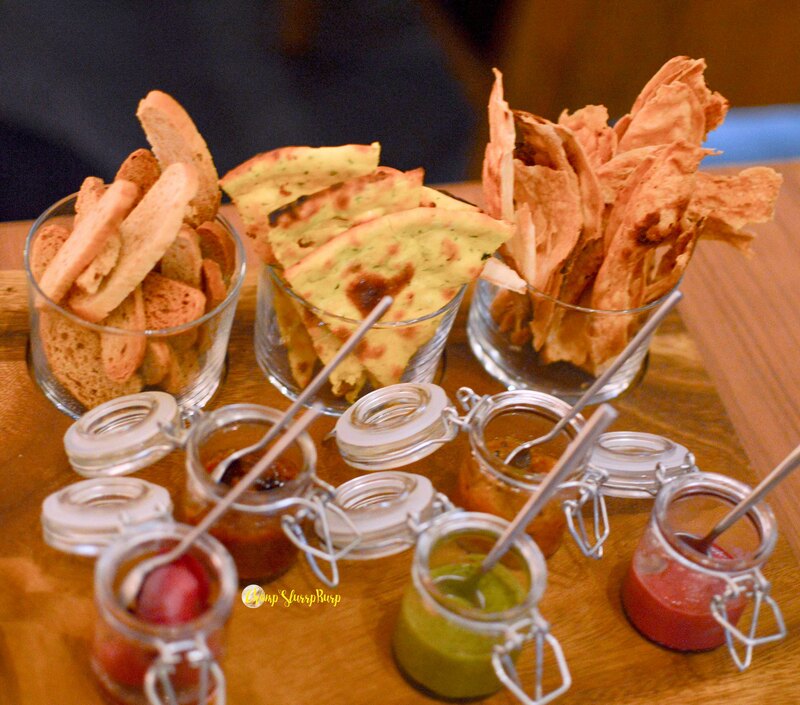 We started with Roti, Chutney, Achar – an enticing take on the bread basket – khasta naan, mini missi roti and masala bread rusks served with an array of chutneys. Fig chutney, pomegranate chutney mint chutney, onions and mutton pickle if you prefer meat, the fig and pomegranate chutney had such gorgeous flavors that you can’t help but gobble it all up. Goat cheese ki tikki – a soft tikki made out of goat cheese, clubbed with pear, mint chutney, pomegranate seeds and a crumbly pate sable – an excellent take on aloo tikki. Crispy aloo chaat – crispy airy aloo, puffed with air and served with sev an chutney, another super crunchy take on the street version. Jack Daniel Tandoori Pork Belly – juicy and succulent pork belly cooked in JD sauce, this pork belly is unlike any other you would have fathomed. 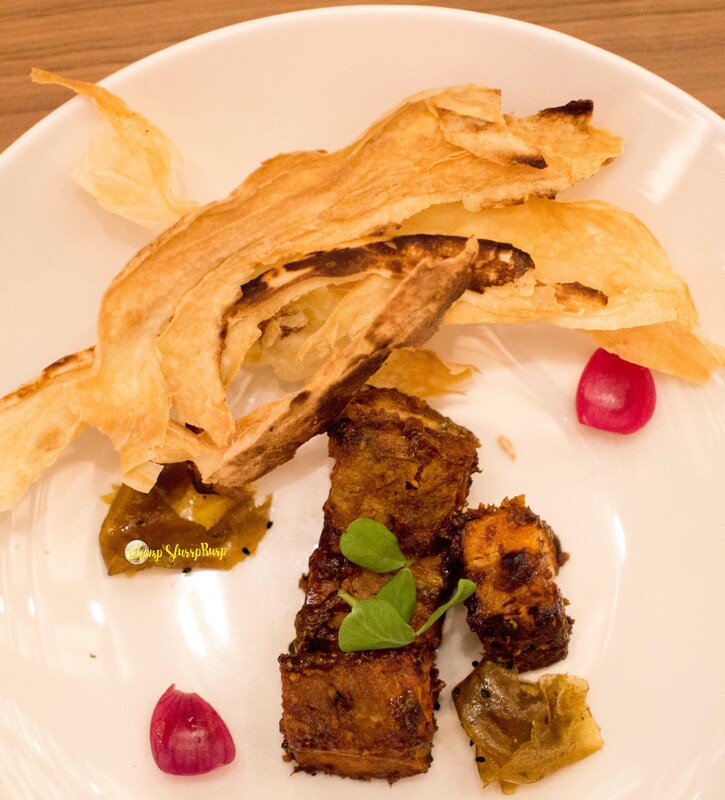 The pork belly has a distint desi touch and is served with khasta naan, home made aam papad and baby vinegar onions. A side of the JD sauce would have been magical though! 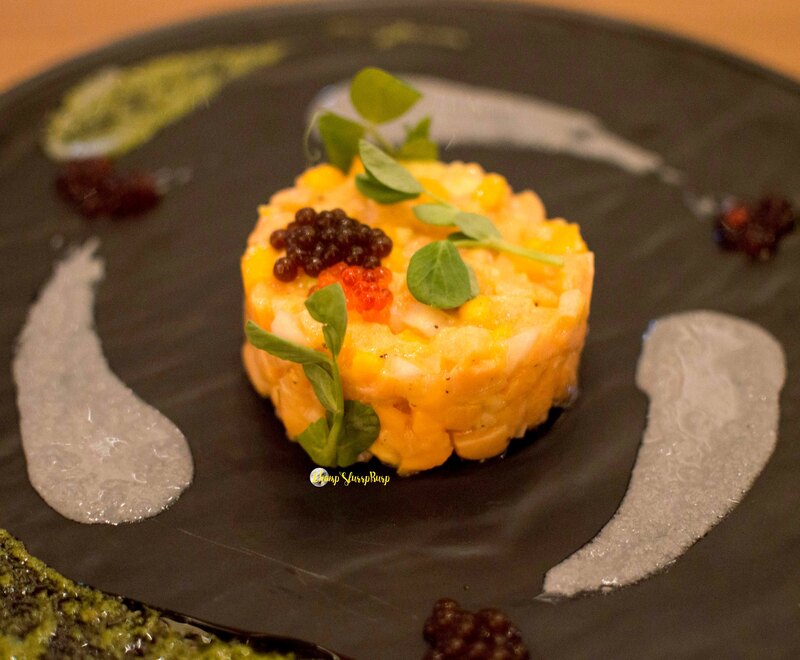 Mango and Salmon – a tantalizing and refreshing whip with diced mango bits intertwined with fresh salmon bits, a spring of green and berry caviar. Summer ready and refreshing. 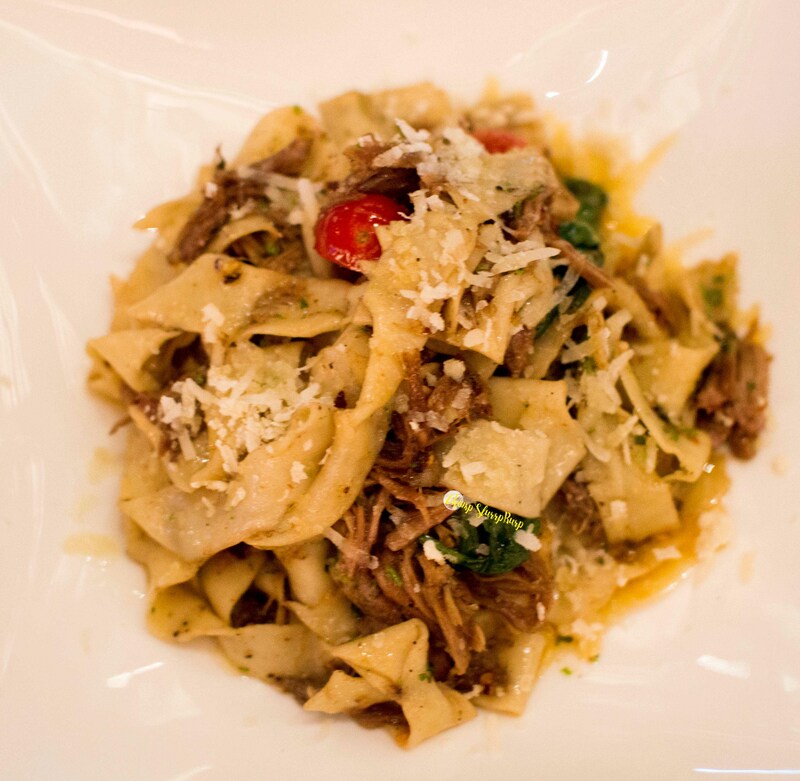 Lamb and Truffle Tagliatelle – shreds of meat, baby spinach, cherry tomatoes and truffle oil with a home made tagliatelle pasta. The authentic pasta is not made out of a box but cooked fresh before being tossed with your favourite dressing. Having trying my hands on fresh pasta before (check here), I knew it was rolled just moments before in a bite. The freshness with a distinct flavor of eggs, I absolutely LOVED the pasta. For mains, we tried their Signature butter chicken and achari meat kulcha. The butter chicken, plated most exquisitely and served with a Parmesan crispie. The succulent chicken bits with a creamy curry. The achari meat kulcha was a soft flaky piece stuffed generously with spicy minced mutton. 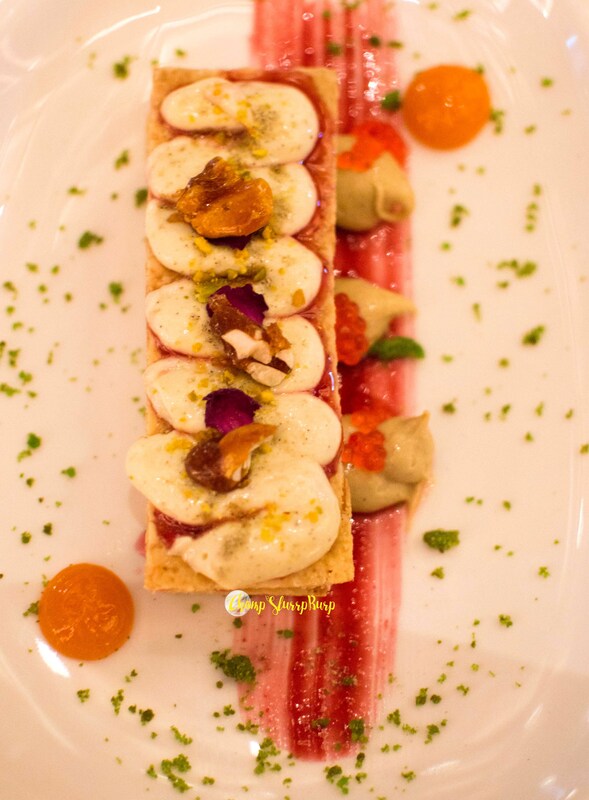 We round up our meal with Shahi Malai Mille Fuille Tukda, Thandai Chantilly Cream – an outlandish take on shahi tukda infused with the French pastry – topped with rich almonds and raisins, rabri and pistachio dust. TREND should definitely be your next party place, mainly thanks to the ambiance and don’t miss out on their updated classics plated to perfection. 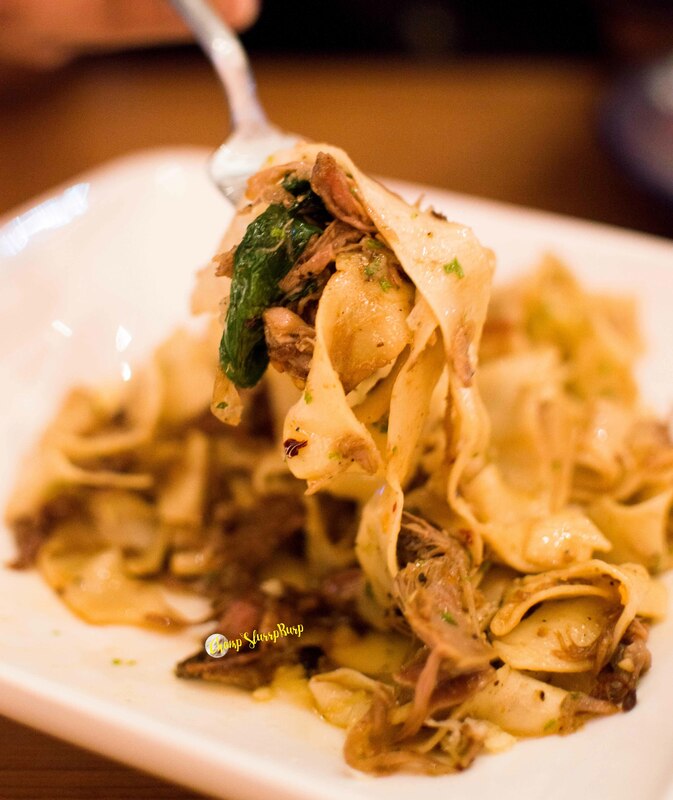 The “Roti Chutney Achar”, JD pork belly and the tagliatelle pasta (if you like your Italian subtle and aglio olio is favored above all) is a must have!